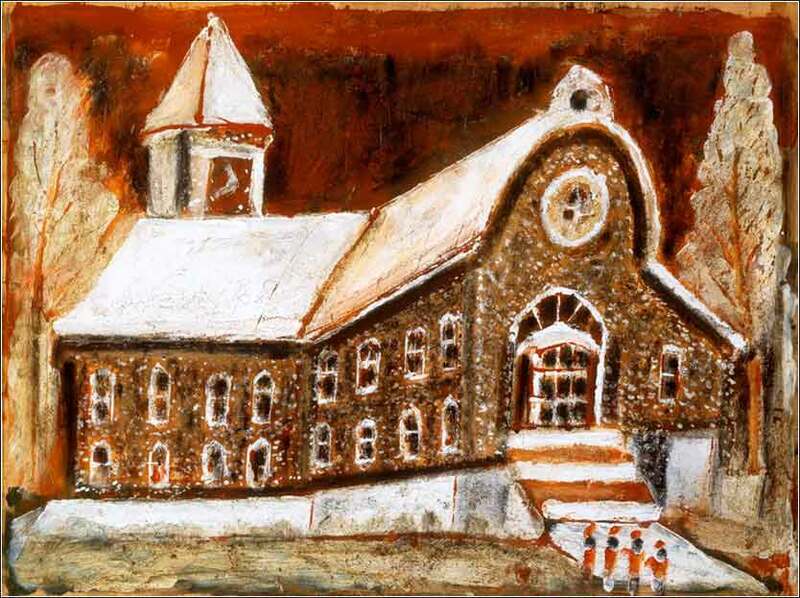 Church by Jimmy Lee Sudduth, ca. 1980. Sudduth painted with a variety of common substances including sugar, honey, Dr. Pepper, coffee grounds, plants, sand and soot. He said there were 36 colors of mud in his backyard. 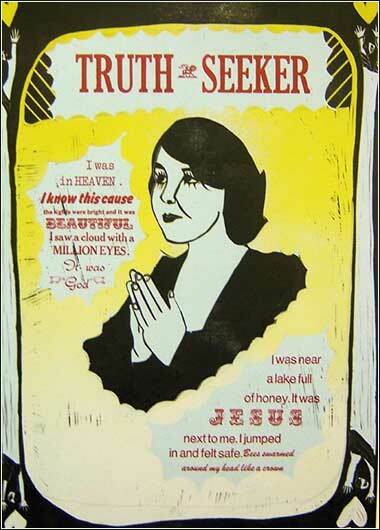 Truth Seeker, linoleum block print by Erin Cross, contemporary. God is not afraid of pain. He does not try to keep us from it. He does not avoid it for Himself. 1-3 Eventually, we could not bear not knowing how you were doing, so we hit on the plan to send Timothy to you, while Silas and I stayed in Athens. Timothy, we thought, being a proven worker for the Gospel of Christ, would be able to bolster your faith against the trials you would certainly face. We knew what you were up against, since we have been through it ourselves time and again. We did our best to warn you what to expect. From what we hear, it was as bad as anticipated. 4-5 I was also, I admit, a little worried that the great Tempter might have enticed you away from your faith, undoing the good we had accomplished among you. Building up the church is our calling; having a church grow in faith means everything to us. So you can understand, it was agonizing when communications were completely cut off and we had no idea how you were holding up. 4 [For] indeed when with you we were, we kept telling in advance to you that we were going to be afflicted, just as indeed happened and as you know. Timothy was an odd bird. His mother and grandmother were Jewish and quite devout; they taught Timothy his Scripture from an early age, and by the time Paul met him, he was well-educated. His father was Greek and Timothy had not been circumcised — which Paul took care of! It would have been painful, as he was an old teenager or perhaps 20ish when Paul and he met; one would guess Paul did this, in order that Timothy might be more effective in preaching to Jews. Anyway, he was converted, circumcised, and left home to accompany Paul and Silas on their journey to Macedonia. He was an extraordinary young man, obviously, and nowhere do we see it more clearly than in today's Scripture. Paul sends him out alone on a fairly long and dangerous journey — probably two weeks, each way — and even more surprisingly, trusts Timothy, both in his knowledge and in his character, sufficiently to let him act in the capacity of a solo apostle to the Thessalonian church. Paul builds him up a little in the epistle, to help him be accepted by the church, but it probably was not necessary at this point; the Thessalonians would have known him well by the time they read this letter. Paul's anxiety about the outcome of his effort seems to be as great a reason as for sending Timothy the first timeJust to make sure it is straight: Timothy had gone to visit Thessalonica a few months after the team had been driven out, which Paul discusses here; he was then sent a second time, to deliver this letter. as his desire to have someone capable bolster the church up. There is no fault in it. Paul's powerful love for the Thessalonians cannot be doubted. His primary concern is not that they may have been murdered, imprisoned, or dispersed, but that they have been led away from salvation. (Either sort of problem, however, would pose a huge challenge for Timothy.) But Paul did not fear physical death or discomfort; he feared hell. If we compare this to most Christians today — and probably, ourselves — it shows how great a difference in conviction has arisen separating us from Paul's red-hot gospel. How many parents do you know, who are much more concerned about their grown children having such comparatively minor problems as not having good jobs, not finishing school, or not being married, than about their lack of faith in Christ?